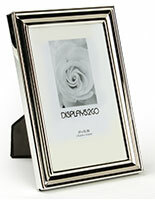 Looking for silver picture frames? 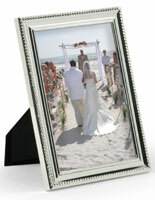 Our selection runs the full gamut of styles, from the most simple, plain designs to the most decorative theme framing. 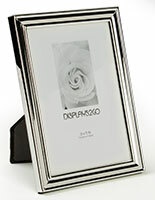 Classic silver picture frames are the perfect complement to any imaging, from baby photos to vintage sepia or daguerreotype portraits to hand drawn art to bold graphic advertising flyers. 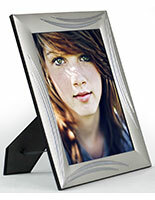 Available in the widest possible variety of sizes, from holders for tiny 1" x 2" photographs and standard 4" x 6" and 5" x 7" prints to collage and panoramic designs, and in a variety of materials including steel, aluminum and silver plate. 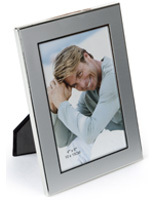 Silver picture frames, called classic photograph display fixtures, are equally well-suited to single images displays or photo album collages. 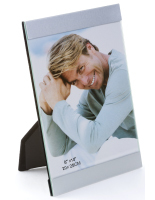 In addition to making great gifts that are easily personalized, these versatile mounts are a superior choice for home, office, commercial, retail use and are also frequently seen at events as place card holders or wedding favors. 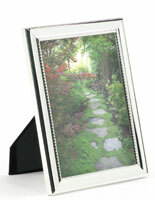 What styles and themes do these photographic displays come in? 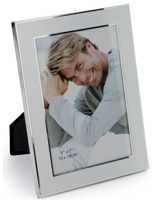 Plain finish silver picture frames without decorative elements are available in steel and aluminum materials in basic matte, polished and brushed finishes. 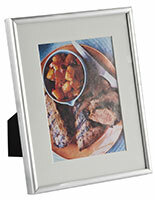 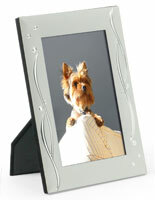 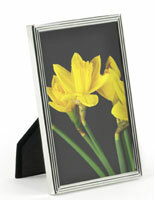 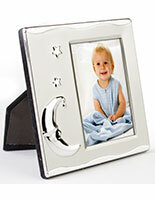 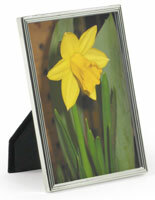 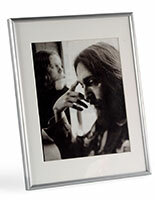 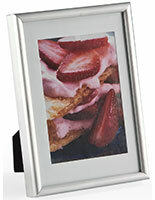 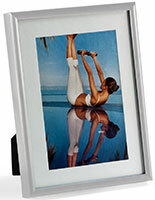 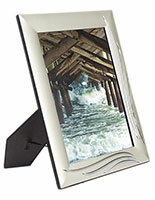 Classic silver metal photo holders feature decorations built into the design of the framing. 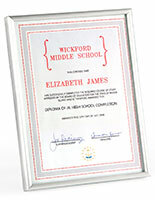 Frame molding, like construction molding, comes in a variety of styles, included beading, cable, dentil, cavetto, fluted, cartouche, filleted and beveled. 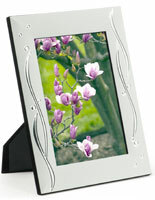 Each molding style will also feature brushed, matte or polished finish as well. 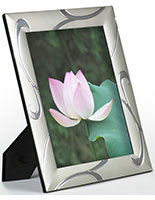 Abstract decorations include geometric or natural shapes such as swirls, dots, squares, waves, lines, triangles and more. 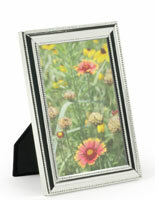 Available styles include clean edge lines or more muted brush-strokes, or as patterned bordering. 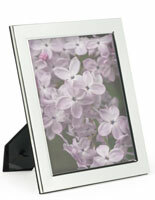 Abstract decorating is especially eye-catching on smaller bulk frames such as 4" x 6" sizes. Love themed mounts are ideal for use as wedding favors, gifts, event place card holders or simply to enhance the feeling imparted by a treasured image or message. 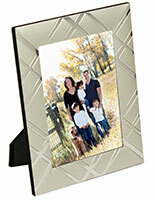 Hearts, linked rings, bells and more fall under this category. 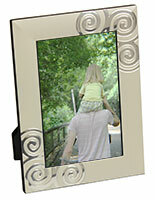 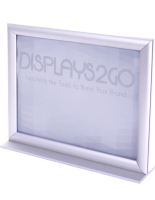 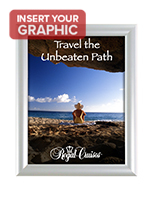 Baby theme frames tend toward simple graphics that are engraved or embossed. 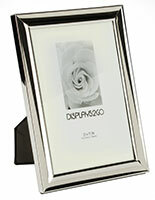 This style silver metal photo holder can go from matching the bright and simple décor of a child's room to more stylish design choices in living rooms or offices. 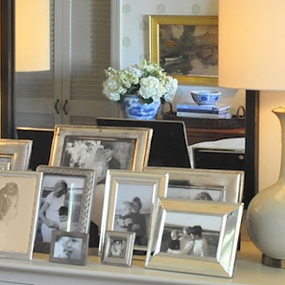 Teddy bears, balloons, images from stories and rhymes, hearts, flowers and simple patterns all fall under the baby décor theme. 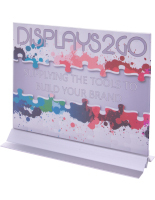 In addition to gifts or place card holders at showers, this type of theme is ideal for children's rooms and also specialty retail or commercial businesses. 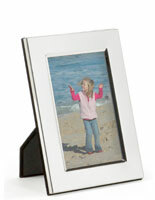 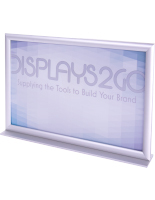 Common sizes include teeny 2x3 tabletop designs, standard 4x6 photography display fixtures and larger, collage-style framing. 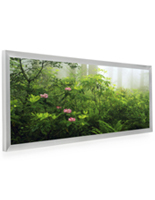 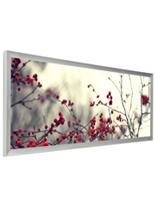 Natural elements such as leaves, stars, snowflakes, footprints, butterflies and more can complement brushed aluminum or steel photograph display fixtures in subtle or overt patterns. 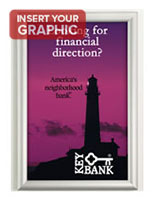 From beach theme wedding favors to summer sale point of purchase advertisements, natural elements can enhance any imagery for home or office. 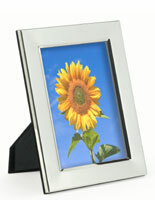 Brushed and polished aluminum, painted steel and other metals enhance the natural element in any style décor. 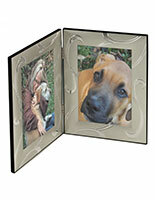 Animal themed displays also make great gifts, as well as being ideal for showcasing treasured snapshots of fin, feather or fur-babies. 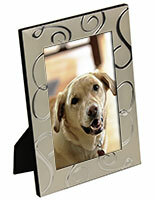 Animal prints can make ideal wedding favors or special occasion gifts, or simply show off a beloved pet's picture at home or in the office. 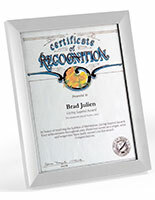 Specialty theme images from Graduation to various sports also draw attention when engraved or embossed on silver metal holders. 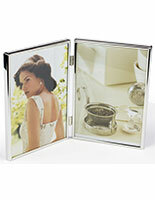 There are almost as many styles and designs as there are photographs or images. 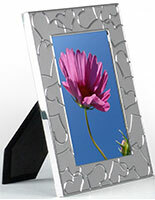 From classic plain, simple styles to themed specialty finishes and designs, steel or aluminum holders makes an excellent, and affordable, choice for home or commercial use. 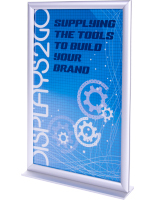 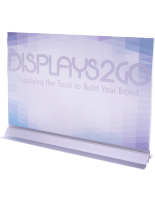 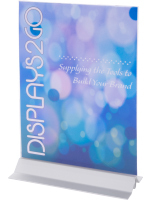 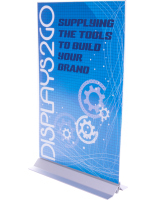 The wide variety of sizes, including 2" x 3", 4" x 6", 5" x 7" and going up to large panoramic 30" x 10" models, will accommodate any size graphic and complement any decor.